I'm sure you saw it all over the news: "Snowpocalypse Atlanta 2014"
When I was a public school teacher (and even in our three brief years as traditional school parents) I can remember the wondering and WAITING for school to be called off in the event of bad weather. In Atlanta school wasn't called off on Tuesday (EPIC fail) and thousands of students were left stranded on buses and at their schools for upwards of 24 hours. I cannot even imagine the worry felt by so many parents. If you have homeschooled for any lenth of time these worries are foreign to you - your children are in YOUR CARE and the buck stops with YOU for the safety and well being. I am thankful to be homeschooling my children, for SO MANY reasons. This week it hit me particularly hard WHY I am thankful. This week's Collage Friday post is a celebration of those reasons. 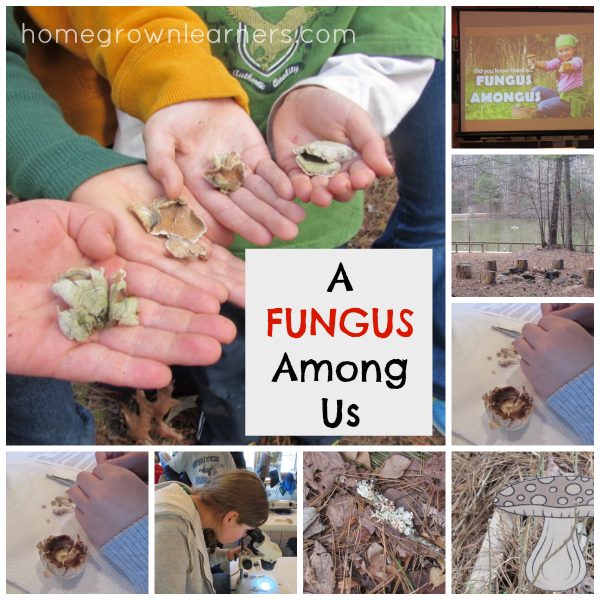 We enjoyed a program at our local nature center on Monday - A Fungus Among Us. The students learned all about what a fungus is and saw many examples. They did a simple lab dissecting a mushroom and looking at its parts under the microscope. Then, we went outside for a fun scavenger hunt: find the camouflaged mushrooms and each one had a fact about fungus. I love these programs because they are full of all ages - my daughter assisted several youngers students at our table. If you've ever been in a room full of homeschooled children you notice that their wonder and inquisitiveness in contagious. I was thankful we had the TIME to spend a relaxing afternoon outdoors learning. I was thankful for friends we spent time with that day, and I was thankful for the knowledge gained. It was a GOOD day. I drove home thinking, "Now THIS is why we homeschool". While children in our local schools were out of school three (in some cases four) days, my children were able to keep up with the rhythm of their learning. Because Anna's Challenge A group is so small (8 students) the moms and tutor made a decision to have school on Tuesday, and when the weather was looking dicey we all went to pick up our children at noon - just enough time for the children to get their assignments and thoroughly go over Latin, Science, and Math. We took many breaks to play in the snow - Anna made snow cream (check out the blog post she wrote about that), too. Lots of time was spent reading aloud by the fire, and dad was able to join in our learning when he wasn't working. Meanwhile, I wasn't concerned about when we would make these days up, if school was going to be cancelled the next day, or who to blame because my child had been stranded at school. Homeschooling your children eliminates SO MANY WORRIES for a parent. I can see that now - so clearly from the other side of the fence. Any way you slice it, being in middle school is hard. Hormones are changing, personalities are clearly developing, and so many emotions run right at the surface. While many might say homeschooled adolescents have it harder, I would contend they have a much EASIER time. I'm not blogging much about my Anna - it's been a time of change for all of us, and it's no secret I have struggled with the change in our homeschool the past two years. Finally, however, being a part of the Challenge program at Classical Conversations, we have hit upon something wonderful. She has a peer group that is small (just 8 in her class and 11 total in our whole Challenge program), but these children know each other well and support and encourage each other. Their interests and personalities really don't matter - they all just accept each other for who they are, and in such a small group their tutor can emphasize that respect. Last week one of Anna's classmates had a grandparent who passed away. Anna and another friend in class created gifts to go in a care basket for this friend and her family. I am thankful she had the TIME to care about someone else - the TIME to create handmade items to show she cared. I am a firm believer in not making our children's lives too busy that they don't have time to foster meaningful relationships and spend time serving others. Last Friday evening she volunteered with a special needs group at our church - 14 people came to learn a music routine and fellowship. What a blessing it was for Anna to be a part of this. She LOVED it. As far as schoolwork goes, I'm immensely thankful for the ability to choose what Anna will be studying. Her course of study through Challenge A is rich and (not to be cliche) challenging. The rigorous study of Latin, the debate during rhetoric seminars, and the immense amount of geography knowledge memorized has me amazed. She's learning to write through The Lost Tools of Writing, and she is diligent about her Saxon math lessons. She read Divergent this week and is intentional about carving out time to read A LOT each week. I have seen so much growth this year, and while we have had our share of difficult moments (because you can't get through this stage without them) I am still convinced we are doing the right thing for her. Believe me, I've had my doubts in the past -- and when we have a hard week the doubts creep in again, but in the end I rest in the fact that my daughter is happy, safe, accepted, and challenged. A parent couldn't really ask for any more. How was your homeschool week? Did you have any "snow days"?